President Bush signaled a willingness Saturday to spend more than what he had recommended for a popular children's health program, but provided no specifics on how much higher he would go. The president on Wednesday vetoed legislation that would increase spending for the State Children's Health Insurance Program by $35 billion over five years. 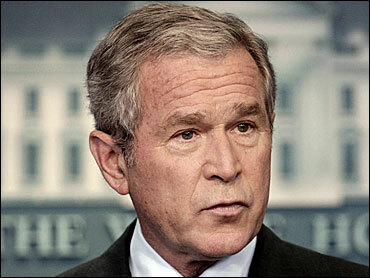 Bush has called for a $5 billion increase. Several Republicans in both chambers have sided with Democratic lawmakers on the issue. "If putting poor children first takes a little more than the 20 percent increase I have proposed in my budget for SCHIP, I am willing to work with leaders in Congress to find the additional money," Bush said in his weekly radio address. Democratic lawmakers say votes to override the president's veto will be held in mid-October. That effort is not expected to succeed. The program provides health insurance to children in families with incomes too great for Medicaid eligibility but not enough to afford private insurance. Bush used his radio address to once again make the case that he believes the spending increase sought primarily by Democrats is a step "toward their goal of government-run health care for every American." "Government-run health care would deprive Americans of the choice and competition that comes from the private market," he said. "It would cause huge increases in government spending." While the government does heavily subsidize the health coverage offered through the program, most SCHIP beneficiaries get coverage through private insurers who contract with states. That was a point stressed by Rep. Steny Hoyer, D-Md., majority leader in the House, when he provided the Democratic radio address Saturday. "The truth is, America's largest private insurance lobbying group supports this bill - as do America's doctors, nurses, children's advocates and, most importantly, 72 percent of Americans," Hoyer said. The president also said the bill moving through Congress needs to move adults off the program. However, his administration has approved waivers that allowed some states to cover adults. "In fact, based on their own projections for this fiscal year, Minnesota, Illinois, New Jersey, Michigan, Rhode Island and New Mexico will spend more SCHIP money on adults than they do on children," Bush said. "And that is not the purpose of the program." The bill passed by Congress does call for gradually giving states less federal matching money when covering certain adults. It also says the administration cannot grant any new waivers to states that want to cover adults through SCHIP. The president noted that his administration has added more than 2 million children to the SCHIP rolls since 2001. Hoyer often cited Republicans to make his point that the bill is bipartisan. "As Senator Pat Roberts, a strong Republican from Kansas, recently said: 'I am not for excessive spending and strongly oppose the federalization of health care. And if the administration's concerns with this bill were accurate, I would support a veto.' But Senator Roberts added: 'Bluntly put, they are not.'"